Women who experience early menopause appear to have more than twice the risk of having a heart attack, stroke or other cardiovascular disease event later in life than do women who do not go through early menopause, a new study indicates. The results will be presented Saturday at The Endocrine Society's 92nd Annual Meeting in San Diego (see also Heart Disease). Early menopause was defined as going through menopause before age 46, either naturally or surgically through removal of both ovaries. "It is important for women to know that early menopause is a potential risk factor for cardiovascular disease-the number one killer of American women. They can then work harder to improve their modifiable risk factors, such as high cholesterol and blood pressure, by exercising and following a healthy diet," said the study's principal author, Melissa Wellons, MD. She is a fellow at the University of Alabama, Birmingham. Previous research found a link between early menopause and cardiovascular disease in mostly white and European populations, according to Wellons, but the new study had a multiethnic representation of women. Of the more than 2,500 participants, about 40 percent were white, 25 percent were black, 22 percent were Hispanic and 13 percent were Chinese-American. At the beginning of the study in July 2000, women were ages 45 to 84. Nearly 28 percent of the women reported early menopause; 446 women had natural menopause and 247 had surgical menopause. Women not yet past menopause were included in the group that did not have early menopause. 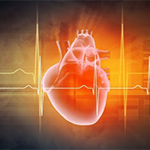 Follow-up tracked whether participants had a cardiovascular disease event, which included a heart attack, nonfatal cardiac arrest (a suddenly stopped heart), angina (chest pain due to narrowed or blocked arteries), probable angina followed by angioplasty or bypass surgery, a stroke or death due to stroke, heart attack or other cardiovascular disease. No one had any such event before age 55. After that, women who had early menopause were more likely to have had a cardiovascular disease event than women who had not gone through menopause before age 46. Even when the researchers' statistical analysis controlled for current or previous use of hormone replacement therapy or for major cardiovascular risk factors, it did not change the results. Early menopause remained a risk factor on its own, although it is unclear why, Wellons reported.